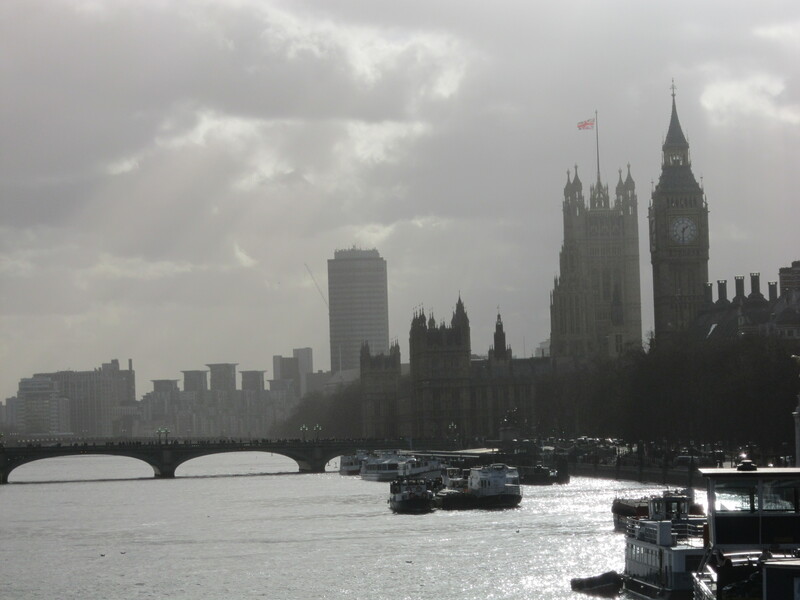 What does winter look like to you? Growing up in Newfoundland, winter means lots of snow, chilly weather, and long months of dark, cloudy days. I picture driving to school in the morning after a fresh snow, when the roads are white and the snowflakes still cling to empty tree branches and weigh down the needles on the fir trees. The snow banks pile up until they’re towering over your head and small mountains are created in the mall and university parking lots. Downtown becomes an unmanageable maze of streets, where your worst fear is forgetting the overnight street parking ban and waking up to a fresh, new ticket on your windshield. Winter is blizzards and blowing snow and wearing your pyjama’s inside out in hopes of a snow day. It’s waiting in anticipation to the closures on the radio and knowing that if only metrobus or the Avalon mall will shut down, then you’re home free for the rest of the day! Snow days are a rare time to bunker down for some quality time with your family or bundle up in your snowsuit to trudge up the street to visit your childhood friends. Winter is back-breaking shoveling and kind neighbours who snow-blow your driveway for you. It’s waking up in the morning and cursing the snowplow for leaving a pile of wet-snow-turned-to-ice at the end of your driveway that you’ll have to chisel through to get to work. It’s edging your way to the corner of the road until you can just see around the snow bank and crossing your fingers that no one hits the nose of your car. If you’re a walker, it means putting your life in the hands of God each and every day as you attempt to navigate the sidewalk covered roads. 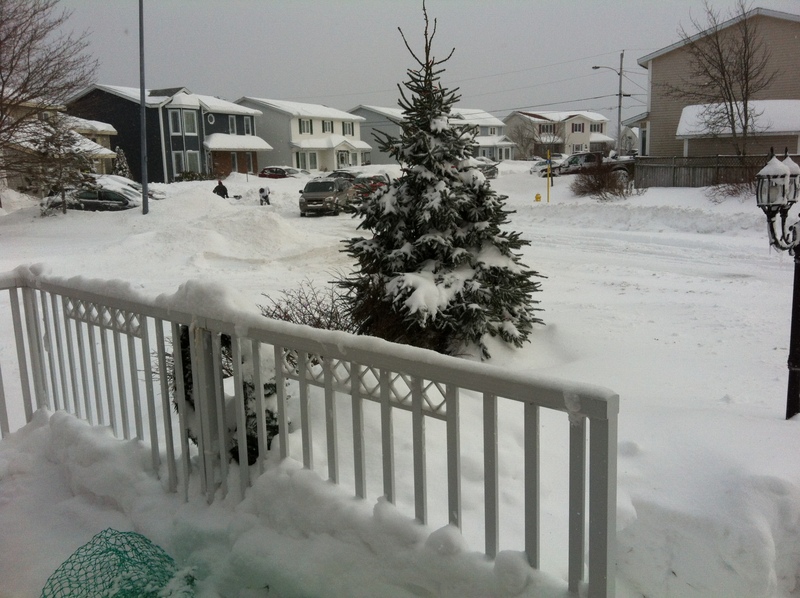 In St. John’s, winter can be long months of the rain-snow cycle which usually ends in piles of dirty, brown snow and slush. But it’s also the fun of going sliding down Pippy Park hill, building snow forts in the backyard, visiting the CONA Winter Carnival, and hitting the road for a weekend of skiing at White Hills or Marble Mountain. It’s the Christmas lights decorating the parkway, the signal hill star shining across the city, the childlike glee of waking up to an unanticipated school-free day, and snowy nights spent playing games and eating pizza with your family and friends. If I could be in a relationship with winter on facebook, it would probably be ‘it’s complicated’, but it’s the winter I’ve grown up with and begrudgingly come to love. This year I got to know a whole new side of winter. Nostalgia aside, it was pretty awesome! It snowed once in Vancouver in November and I was sure winter was on the way. I came back after my Christmas break expecting to see snow covered mountains and feel that winter chill in the air, but it never came. I feel like I was waiting for winter to arrive and then I finally woke up one day and realized that it was spring and that evidently, winter had decided to skip over the west coast this year. I was a little nostaglic from all the epic pictures of snow in St. John’s, but I quickly realized that Vancouver’s mild winter has some definite benefits! It’s officially spring and the temperature has been flirting around the 12-15 degree zone pretty regularly since February. The cherry blossums and magnolias have already come and gone and after a three week sun marathon in early March, Seth and I decided to trade in our snow boots for hiking boots. We’ve been out hiking around the lower mainland several times over the last month and love that the beautiful BC wilderness is just a short drive from the city. 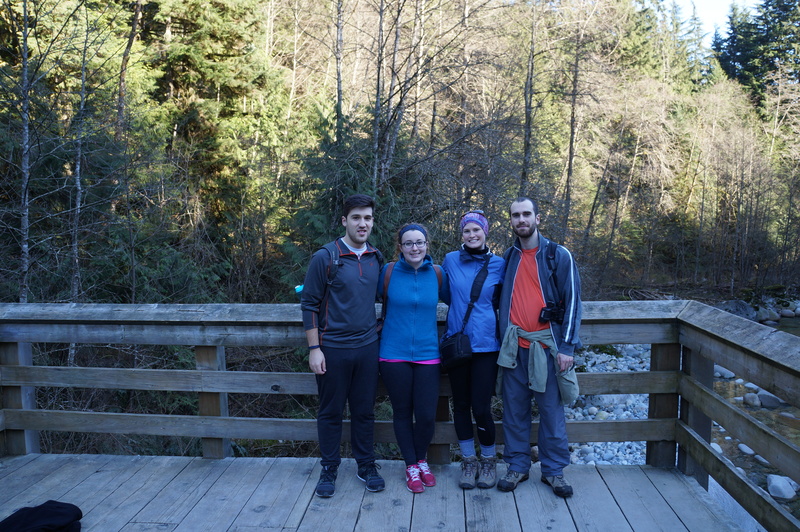 We started off our hiking season with a circuit around Burnaby Mountain – the highest point in Burnaby and home to Simon Fraser University. There’s a great view of Vancouver from Burnaby Mountain Park and we spent an afternoon hiking around the back of the mountain through second-growth forest looking out over Burrard Inlet. We had a great day out in the sun and finished with an exciting near-encounter with a black bear! Apparently they’ve been coming out of hibernation early this year on account of the warm weather. 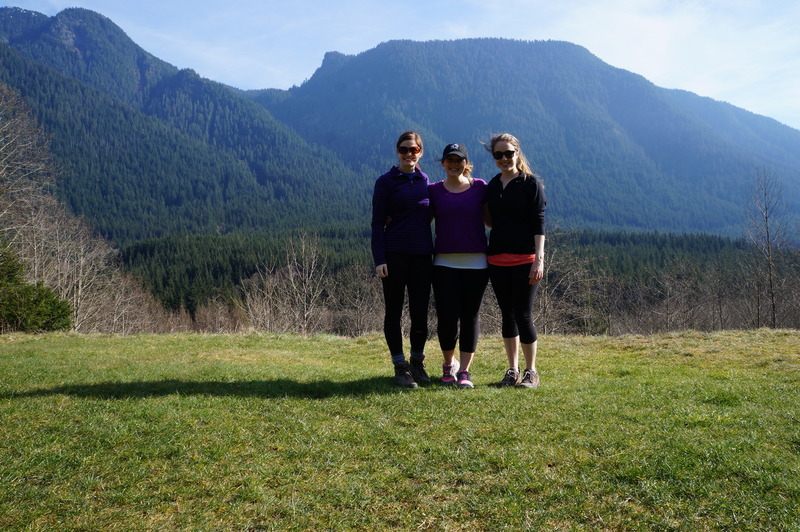 We also did two hikes in the mountains of North Vancouver. The watershed and reservoirs for the lower mainland are located in North Van, so I spent a lot of time working up there over the summer and there are a ton of great hiking trails along some of the rivers. Karen and Grant joined us for one of the hikes and we ended up getting immediately lost. We’re not the most observant and missed a sign telling us that the bridge we were trying to cross to start our hike had been removed after a landslide upstream flooded the area (including the trail we were planning to hike). We ended up doing another hike, which I’m sure was just as nice, but it wasn’t until the following week when I tried to do the same hike again with my friends Amy and Steph that we finally noticed the sign informing us of the landslide. So I ended up doing two unintended hikes, but they both ended up being gorgeous! Seth and I had another little adventure in February when we decided to make a trek down to Washington to go on a camel safari! That’s right, I did say ‘camel safari’. Seth found one of the funnier groupons I’ve seen, advertising a ‘Camel Encounter and Segway Tour’ and purchased them on a limb. We decided to make a day of it and had a great time learning all about camels and how to ride a segway. They’re pretty intuitive and we had a good laugh driving them around the farm. We finished off the tour by bottle-feeding some of the younger camels! In other news, I’ve been making some pretty good progress on my bucket list (see the right side of my blog for a full update). We went to see comedian Tig Nataro in January and we saw our first NHL game! The Canucks played the Jets and won in overtime, making for a pretty exciting first game. We caught our first concert of the year at the end of February when we saw Hey Rosetta! play at the Vogue Theatre. I also bought a new vegetarian cookbook, so I’ve been having some fun cooking as well. I tried out a few recipes and our favourites so far were a thai vegetable pizza, homemade samosa patties, a hearty edamame salad, and delicious spinch-baked manicotti. Unfortunately, you can’t win at everything; the warm weather has resulted in the skiing around Vancouver being very bad this year. There’s three ski hills right outside Vancouver that have been closed almost all winter and Whistler has really been suffering on the bottom half of the mountain. We decided to try Whistler a few weeks ago since we didn’t think we’d have many more opportunities, but other then that, I haven’t accomplished any of my winter-related bucket list items. Whistler was pretty bare on the bottom, but it was completely covered in snow on the top and we still ended up having a pretty good day on the top half of the mountain. 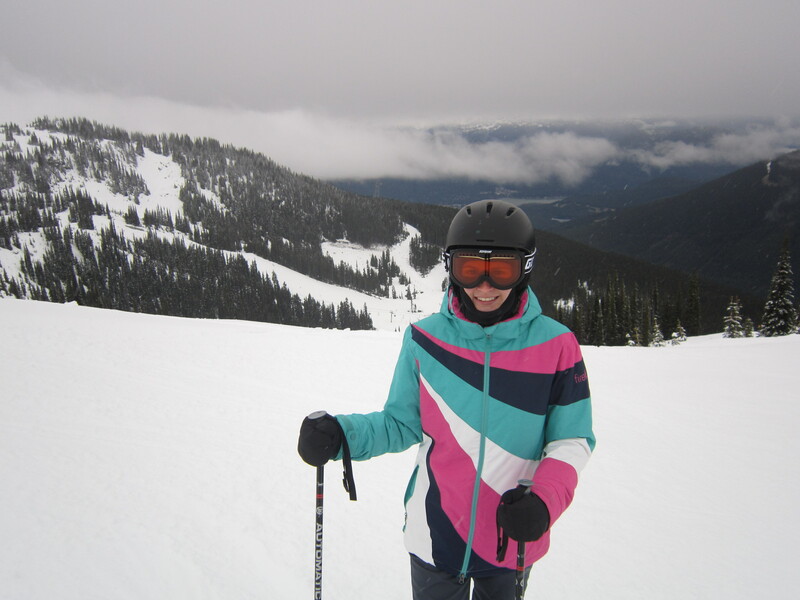 It’s a huge resort, so we stuck just to Whistler and didn’t even try to ski any of Blackcomb mountain, which will have to be a trip for next year. I decided to add a new item to my list and saw Vancouver’s soccer team, the White Caps, play this week. They played their rival, Portland, and didn’t let us down with a win in the last few seconds of play! It’s Easter this weekend, so we’re off to Ontario to spend some time with family. After that, my trip to Brazil will be less than three weeks away, so I’m looking forward to getting some international travelling in! In conclusion, I didn’t get my traditional winter this year, but the warm, sunny weather in Vancouver more than made up for it! I know spring might still be a while away for my family on the East Coast, but I’m looking forward to more outdoor activities on this side of the country. Appreciate what you can about the snow my friends and come visit me if you’re looking for a little break! After a shocking four month blogging absence, I’m stretching out my fingers and dusting off my keyboard just in time to take you with me on my highlight trip of the year – a 10 day road trip down the American West Coast with my 3 absolute best friends in the world! Though my lack of blogging might have you believe otherwise, it’s actually been a very eventful spring. I’ve already made one trip down to Washington State with my sister, celebrated Canada Day in the Capital with my family, and caught up with my friends in St. John’s, but now it’s time for the big trip! I’ve taken a few “road trips” with my friends over the years – Northern Bay Sands, White Hills, Bell Island – but they’ve always been within several hours driving distance of St. John’s, so this year we decided to step it up a notch or two and try to tackle a greater part of the West Coast! Something about the exciting combination of ocean, mountains, and gigantic trees seems to call people to Vancouver and lucky for me, this time it’s my 3 best friends! They all arrived this week and after spending a few days in Vancouver, we’ll be taking off this weekend for San Francisco. Along the way, the amazing list of attractions we’ll be hitting include Seattle, Portland, Lake Tahoe, Yosemite National Park, San Francisco, and Santa Cruz! To start us off, there’s Melissa – our driver, music enthusiast, and social media guru. Apparently the rest of us are still babies and Mel is the only one who can rent a car without having to pay outrageous “young driver” fees, so thank you Melissa for being born in the 80’s! Along with age comes wisdom and for many years Mel has been educating us all on music, celebrities, and popular culture; without her I would know nothing about celebrity gossip, pub trivia, or Kathy Dunderdale’s twitter account. She’s our social media expert and I expect she’ll be tweeting and instagramming and snapchatting (and whatever else is popular these days) every moment of the trip! She’s one of the wittiest people I know, so follow along her social media for a guaranteed laugh (#biffleroadtrip). She’s also our token hipster and our adventures in Seattle and Portland (hipster capital of North America) are all thanks to her! Next in the lineup is Gill, known by one name and one name only – The Chosen One. The Gods have always favoured her and for reasons we can’t explain, things always work out for her. We’re depending on her for good luck, sunny weather, and for a free upgrade at the car rental place. Gill makes her own rules and she’ll call you out when she thinks you’re wrong. She played zero role in the trip planning phase, but she’s always up for adventure and we’re counting on her to keep us all entertained on the long stretches of road! She is our trip dramatist, Mariah Carrey impersonator, prankster extraordinaire, and game lover. The name of the game of the trip is Dutch Blitz and she’s got the title of Champion in mind. So don’t mess with Gill and don’t mess with us, because you don’t want Gill coming after you. However, in the excitement, she has decided to take on the role of our trip vlogger, so stay tuned for those which we’ll also be sharing on my blog. And then there’s Karen, our happy-go-lucky, common-sense wielding, keeper of the peace. Without Karen we’d never get anywhere, ever. The rest of us will mull over a problem for 10 minutes, decide there’s no solution, and then Karen will pop in and solve it for us in 30 seconds! Karen goes with the flow and her calm and loving nature keeps the rest of our crazy at bay. But don’t be fooled, I’ve gone on many a childhood trip with this girl and she can scheme just as much as the rest of us (and do it better). She’ll always join you in whatever shenanigans or ‘fun’ new idea you dream up. She’s got logic on her side though, so you’d better watch out when you break out the games. She’s surprisingly not great at Dutch Blitz (we think the element of speed works against this thorough thinker) but we’re also bringing Catan along and we suspect she’ll be the ultimate strategist! And lastly there’s me, I’m bestowing upon myself the title of Trip Captain, known as a sunscreen enthusiast, owner of bad hats, and Blitz Superstar. 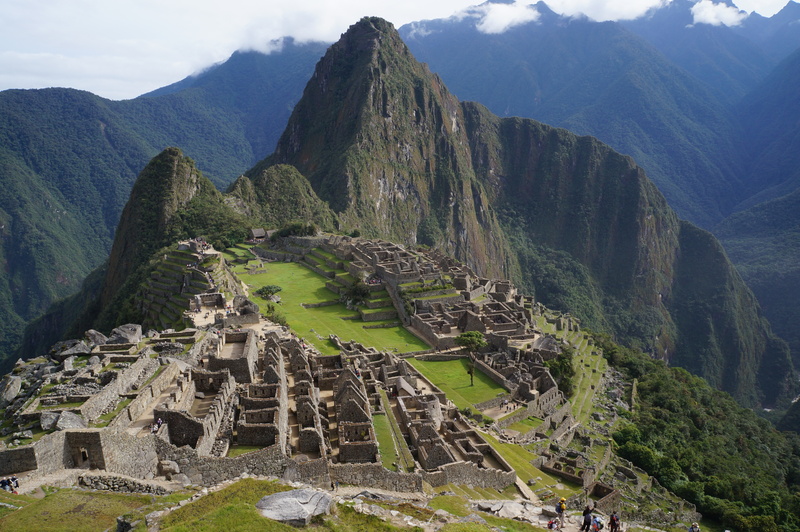 I’m just saying it, without me this trip wouldn’t be possible. I am the planning goddess, but fortunately I have my biffles to keep me humble, which they’ll do when we hit the first snag on the road. Despite my trip planning skills, I generally have no idea what’s going on and find myself at the receiving end of a lot of jokes. But I’m good natured and I’ll go along with the jokes because we all know that the group is lost without me. I’m a resident of Biffle HQ, founder of the legendary Pizza Fridays, owner of our mascot Sammy, and a believer that old dogs are just as cute as puppies! I love my friends more than anything and I can’t wait to go on this adventure with them!